The National Tertiary Education Union (NTEU) says the design of the scholarship scheme is structurally flawed because universities with the highest proportion of disadvantaged students cannot offer the same value or number of scholarships as universities with lower numbers of disadvantaged students. Under the Government’s reforms, students from disadvantaged backgrounds including from regional Australia will have access to the new Commonwealth Scholarship scheme. Their higher education institution will help them with their costs of living while they study. The scholarships will also be able to cover fee exemptions and mentoring, tutorial support and even relocation and living expenses. The problem as the following simple example shows is that Minister’s claims simply do not add up. 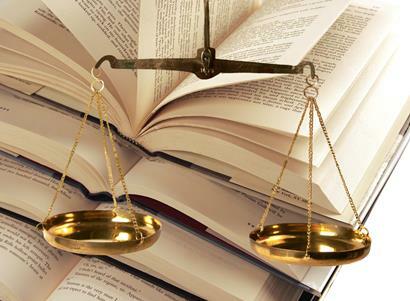 Let’s take a simple example of two universities, University A and University B. Both universities have 16,000 domestic undergraduates who all currently (before the effect of any of the government’s proposed changes take effect) pay a maximum tuition fee of $8,000 per annum. The one major difference between the two universities is in terms of the number of students from disadvantaged backgrounds they enrol. University A, a well-established inner city university has a total of 1,600 (10% of total) students from disadvantaged backgrounds. University B located in regional Australia has 4,000 (25% of total) students from disadvantaged (low SES) backgrounds. remove the cap on how much universities can charge domestic undergraduate students (currently set at $8,000). For purpose of direct comparison let us further assume that both University A and University B now react in exactly the same way. With the cut in funding and the removal of the cap we assume that both universities decide to increase their fees to $13,000. Of this $5,000 (62.5%) increase keep in mind that almost half ($2,400) is simply to compensate both universities for the 20% cut to government funding per student. The government’s ‘new Commonwealth’ Scholarship Scheme requires each university to set aside $1 in every $5 of increased student fees (above that necessary to compensate for funding cuts – $2,400 in our example) to be put aside to fund scholarships for disadvantaged students. In other words, in the scenario outlined above Universities A and B would both be required to allocate 20% of additional $2,600 increase in fees into a Commonwealth Scholarship fund. That is, each university would be required to put $520 per student into the Scholarship fund. Given that both universities have 16,000 domestic undergraduate students this means they would both have a Commonwealth Scholarship fund worth a total of $8,320,000. University A would be $5,200 ($8.32m/1,600) per student. University B would be $2,080 ($8.32m/4,000) per student. In other words, the value of an average scholarship for a disadvantaged student studying at University A would be $5,200 per student which barely covers the $5,000 increase in fees that all students will have to pay to fund the scholarships. At University B the average value of the scholarship would be $2,080 which goes nowhere near covering the $5,000 increase in fees. That is, on average disadvantaged students at University B will be $2,920 worse off per year. How does this look when applied to Australia’s universities? Australia’s universities varies from a low 5% at ANU to over 40% at Central Queensland University. As Chart 1 shows, the higher the proportion of disadvantaged students a university has, the greater the gap between the increase in fees and the average value of scholarships. In other words, the scheme has an inbuilt structural flaw which disadvantages those universities with high proportions of disadvantaged students, which are predominately regional and outer metropolitan universities. How are universities to respond? The example above also highlights a major dilemma that universities with large numbers of disadvantaged students face. 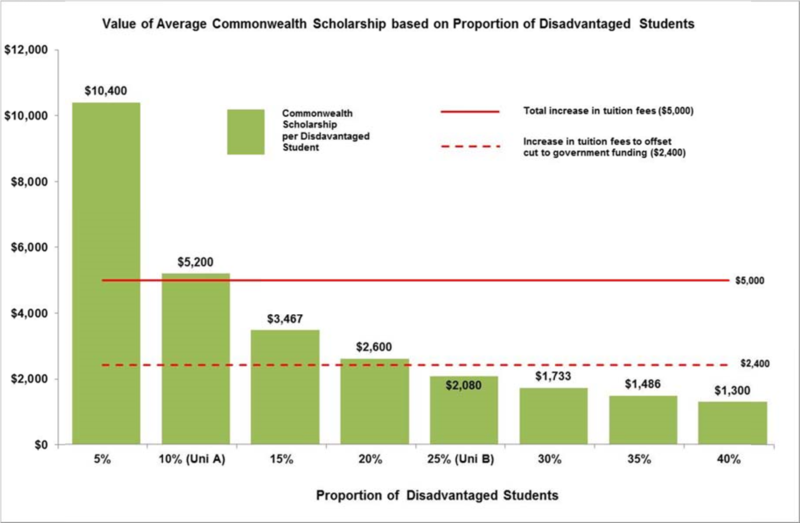 The irony of Mr Pyne’s new Commonwealth scholarships is that disadvantaged students at University B (or any university where there are more than 20% disadvantaged students) would be better off without any Commonwealth scholarships because the increase in fees needed to offset the cut in public funding ($2,400) is less than the increase in fees of $5,000 less the value of the Scholarship ($2,920). University B of course could elect to be highly selective and not offer all of its disadvantaged students a new Commonwealth scholarship. For example, if it only offered 1,000 scholarships (to one in four of its disadvantaged students) the average value of the scholarship would be $8,320. While this would make the 1,000 lucky recipients better off, it would make 3,000 other students considerably even worse off. A further dilemma faced by universities, like University B, is if they do the right thing by their students and limit fee increases to the amount need to compensate for cuts to public funding ($2,400 in our example) this might not be in the universities best interests of because it would deprive itself of much needed funding ($4 of the $5 increased fees) to improve the quality of the educational experience and its research and community engagement. In trying to sell his new higher education package, the Minister has claimed that new Commonwealth Scholarships will lead to record levels of scholarships for disadvantaged students despite the fact that his policies also include abolishing about $800m worth of existing student start-up and relocation scholarships. Mr Pyne has also suggested that scholarships could cover not only tuition fees but also include living and other expenses as well. So the question is how much would fees have to rise in order for universities to be in a position to offer scholarships that would not only cover increased fees but also name a contribution to living and other expenses? The answer to this depends on a number of factors including how many scholarships a university will (or be required) to offer. For University B the average value of a new Commonwealth Scholarship would be $2,080 if it awarded to every one of its 4,000 disadvantaged students. Let’s assume that each university would like to award scholarships which not only cover the increase in tuition fees but also provide each scholarship awardee with an additional $10,000 in funding to help cover living and other expenses. University A could achieve this by keeping the fee increase to $5,000 but only awarding scholarships to just over a third (about 550) of its disadvantaged students. If however, University A wanted at award all of its disadvantaged students such a scholarship it would have to increase its fees close to three fold (200%) to achieve this outcome as shown in Table 1. The task for University B however is much more difficult. In order to keep its fee increase to only $5,000 or 62.5%, it would also have limit the number of scholarships to about one in seven (13.2%) of its disadvantaged students. Putting this another his means that about 3,350 of University B’s 4,000 disadvantaged students (86%) would miss out on a scholarship. Unfortunately, University B cannot award all of its disadvantaged students a scholarship which would deliver them $10,000 more than the increase in student fees. As Table 2 shows the more University B increases it fees the worse off all disadvantaged students would be. So what is the situation for an average Australian university, where 16% of its students come from low SES backgrounds? The situation is summarised in Table 3 shown below, which shows that if Pyne’s new Commonwealth Scholarships were to deliver every disadvantaged students a scholarship which cover the increase in fees (still have to pay the original $8,000) and a $10,000 allowance to go toward living and other expenses, would require fees on average to increase to $60,000 per year. The design of scheme structurally flawed because universities with the highest proportion of disadvantaged students cannot offer the same value or number of scholarships as universities with lower numbers of disadvantaged students.